September-only… Click HERE for the official entry form! Oh man I just missed this deal! 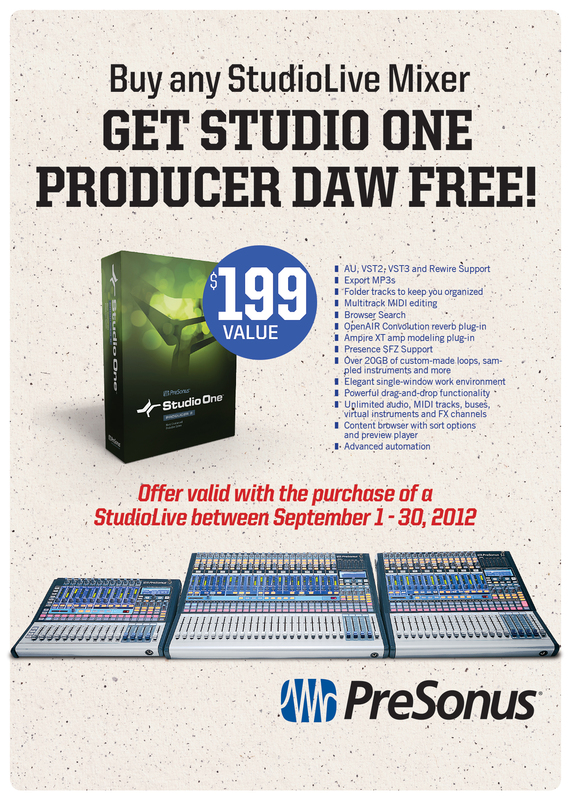 I was planning to buy a Studiolive 24 next week. problems problems problems!!!!!!aaaarhhhh! ever since i got this mixer it’s BEEN PROBLEMS! SPENT BIG MONEY TO START MY BUSINESS AND NOW MY PRESONUS 16 HAS BEEN PROBLEMATIC EVER SINCE I GOT IT….TOO FRUSTRATED! Cant beat a good mixer mate.. try get an old one cheap, and mess with it..Mix it with digital on the way in and mess with it on the way out.. Result.X.. Resistive technology doesn’t have to be mimicked all the time. Guess I should have waited a couple of months to buy my mixer.